Today I've got more Reindeer Games for you ('Cause we just can't get enough of them!) and the introduction of Jingle Greetings. Jingle Greetings was designed using my handwriting. 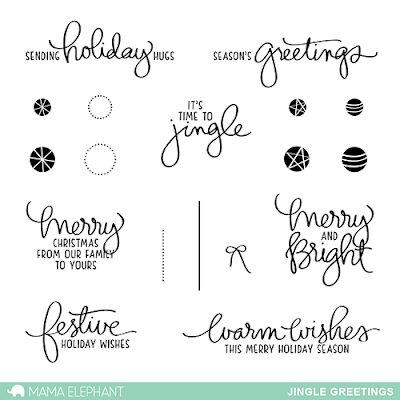 It's got a different feel than our wildly popular Merry Greetings, the script has a more ribbon-like style. I like the thicker lines, they look so beautiful stamped in color. Okay, so one day I sat there and stamped, colored and cut about 30 reindeers. That's a lot of reindeers! I put them to good use here, stacking them together! To create the soft background. I die cut a large piece of masking paper using Landscape Trio to create the ground/hill. I masked off the bottom and softly blended a sky from the bottom up using our Rainwater pigment ink. Aren't those reindeers just making you wish the holidays are here already? I went a little bit artsy with this card you may've seen a sneak peek of on our first Periscope (our username is mamaelephant). The large ornament is from Twinkle Towns, I really like the largeness of the ornament, it really gives you the freedom to paint and decorate however way you wish! Edited to add: the ornaments were painstakingly painted using Winston and Newton watercolors! See you back here tomorrow! We're getting closer to release day, slowly but surely! ooo love it! those scripty sentiments are super! so in love with the reindeers and a perfect combo with the sentiments. they need to be quickly shipped to Belgium!!! Love the sentiments and your handwriting font... Those reindeers are too cute! The ornament card is beautiful! Pretty sentiment set. The reindeer are just the cutest all stacked up, and your ornaments are just amazing!! Perfect sentiments, I love the font of the style of the writing very beautiful! The reindeer card is so fun, and the ornament card is just gorgeous! Such fabulous coloring on the ornaments. It is really time to jingle.. This is Amazing release..I love all stamps and dies. CAN YOU Mama Elephant ADOPT ME please!! Love the pyramid of reindeer. the writing is pretty - has to fill in for my terrible handwriting. I love these christmas sentiments! They're pretty normal, but with just a ME flair! Can't wait to get this one!! Love the font of the sentiments. Those reindeer are so cute - but I have said that already :) and the timeless ornaments. I wish you would tell us how you colored the Christmas ornaments. They look so real and 3-d. Your reindeer are adorable, Kryssi...Such a cute card! I love how you water colored the ornaments...wow! I think you should frame this card, and hang it in your home during the holidays...it's really stunning!!! Gorgeous sentiments. The little deer are adorable and Kryssi's ornaments are fabulous. 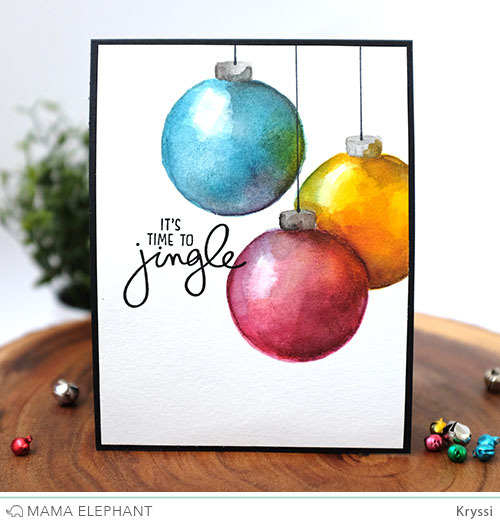 The ornament card is such a beautiful work of art, and I love the style (font) of the sentiment stamp set. I love the new Jingle Greetings and hope there will be a coordinating die! wow that ornament card is a masterpiece. the colors and shading alone...even captured reflections....fantastic. Love the scripty-ness of the greetings! Those ornaments.. wow.. just wow.. Exquisite. Two fabulous cards and another stamp set I will definitely 'need'! What a wonderful release!!! Really beautiful font in this set! Kryssi is so talented to go from cute reindeer to stunning water colored ornaments. I love the beautiful watercoloured ornaments, and the greetings set is perfect, I would use all those sentiments. Kryssi you are so talented.